Comedian Jeff Foxworthy has a broad, family-friendly appeal beyond those who might be rednecks. 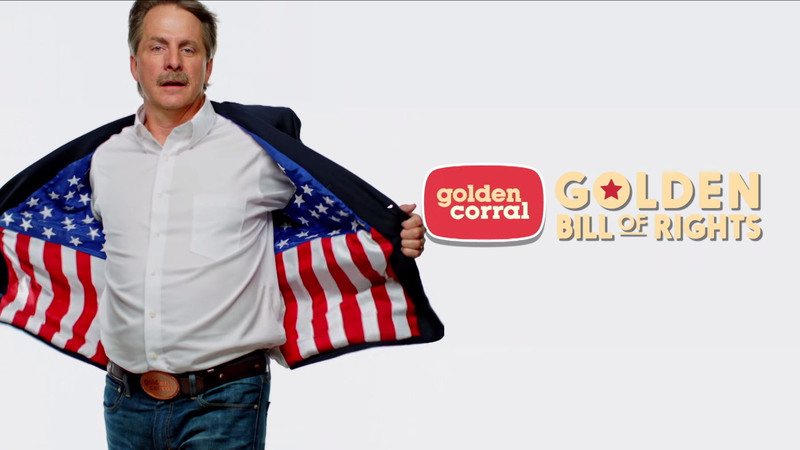 And Golden Corral, the North Carolina-based buffet-dining chain, is looking to leverage that relatability in its new "Golden Bill of Rights" campaign, which features Foxworthy as the brand's spokesman. "It's his comedy," said Chris Kuehn, the chain's chief marketing officer. "Everybody can relate to it." Last year, the 500-unit chain spent $55 million on media, according to Kantar Media. The first spot in the campaign debuted during a special edition of Foxworthy's Are You Smarter Than a 5th Grader? last Friday night and went wide on Monday. Four more will roll out over the summer months, tied to Golden Corral's new breakfast-all-day offering. There will also be social and in-store support as the campaign rolls out, and a long-form digital video. In the spot, Foxworthy walks through a restaurant presenting the Golden Bill of Rights, which includes the right to choose freely, the right to food made fresh, and the right to eat out of order. "You want breakfast for dinner?" Foxworthy asks. "It's brinner. Want dessert as an appetizer? That's dessertitizer." There's a tone throughout that's both proudly patriotic and also jokingly over the top. Foxworthy is a good fit for Golden Corral's Southern-based, all-American brand, Kuehn said, because research showed his appeal "cuts across our user base," which includes significant minority components. "It's about the values America was built on, but with a wink" said Leanne Leahy, president of The VIA Agency, which created the campaign. VIA, in Portland, Maine, won the Golden Corral business late last year. "Jeff Foxworthy is an approachable, everyman, archetypical American—and I say that without air quotes," said Leahy. The brand's values are hard work, good work ethic and authenticity, she said, and Foxworthy reflects that.